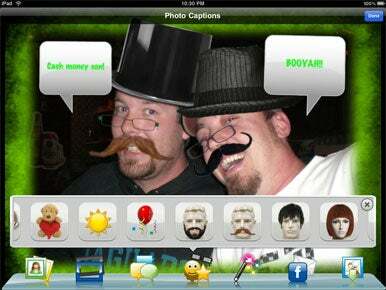 Photo Captions HD, a $3 iPad app from Sprite Labs, lets you quickly add captions, frames and graphics to your photos, or even create greeting cards and collages. Style Points: In addition to adding objects like hats and beards to your photos, Photo Captions HD also lets you add frames, text bubbles, and other effects. You can use any picture you have in your iPad’s photo library. Once you’ve selected a photo to use, you can add other photos to create a collage of pictures. You can also add frames, text bubbles, images and symbols, or filters. The app provides a nice selection of frames as well as text bubbles and icons in lots of different styles. You can add all sorts of funny beards, hairstyles, glasses, hats, stickers and more to your images. You have the ability to position, scale, and rotate those items, though I noticed that if I scaled an item up larger than its original size, it quickly became pixelated. When you add a text bubble, you can choose from a few different text colors and adjust the font size. Photo Captions HD’s filters are pretty basic, with a greyscale, sepia, and some other color tones. The filters only affect the photos and not any of the added items. You also have the option of creating greeting cards using one of the many templates available. Once you’re finished, you can share your creations by posting them directly to Facebook or via e-mail.